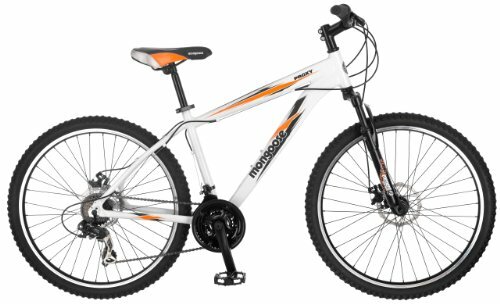 The Mongoose Proxy Mountain Bicycle offers a great ride and versatility with its light but sturdy aluminium frame with fast wheels and 21 speed Shimano rear derailleur with SRAM twist shifters to accommodate all kinds of riding; it is well designed to meet the riding needs of mountain bikers. The disc brakes offer powerful braking force while the alloy wheels are equipped with a quick release front plus it’s crafted with a comfortable and athletic position when riding. The Mongoose Proxy Mountain Bicycleis designed with breath taking speed and superb looks. It performs well for urban movement. It’s pretty easy to assemble provided you have some experience working with bikes. The derailleurs also require some slight adjustments and other than that, it offers a great riding experience. The front shocks works perfectly and handles rocky and rough terrains with ease. The Front & rear disc brakes may take some few minutes to get used to but they are efficiently smooth as well. The seat is comfortable but a bit smallish and the stem is designed to handle ride on grass, mud or gravel excellently. Generally, the bike performs well and offers a total package of speed, style, toughness, ruggedness and reliability. The price of this bicycle is just perfect and it is certainly worth buying.